Have you seen what's in your gear? Why Should You Use Fresh Gear? How Does Fresh Gear Ozone Destroy Bacteria? In the computer models shown above, we see how Ozone works. This is a close-up of a bacteria cell (1). Ozone, shown in green, comes into contact with the bacteria (2). Ozone penetrates the bacteria cell (3), forming a hole in the bacterial wall (4). Multiple molecules of Ozone create a series of holes in the bacteria (5). This leads to cell lysing and destruction of the bacteria cell (6). Unlike other treatments, ozonation does not allow the bacteria to mutate. Ozone is very effective in killing germs that it comes in contact with. We don't just pump ozone into a box, like other cleaning systems (and hope the ozone floats into the right places). Good Health Shouldn't Be A Luxury. At Fresh Gear, our services can protect your health. In fact, our process is worry-free, easy on the environment and our rates are often half the cost of our competitors. Proven results for all athletes. Bacteria growth is highest and hardest to reach on the inside surfaces of sports gear. 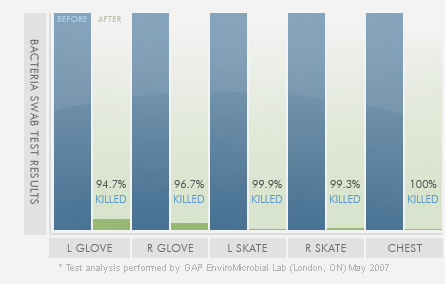 In fact, the typical skate and hockey glove has 100 times the bacteria of any other piece of gear. The hand often sustains cuts and scrapes and is unprotected when placed inside bacteria-filled gloves. This poses a high risk of infection. Through independent lab testing, the Fresh Gear Cyclone has been proven very effective in killing bacteria in these difficult situations, as shown in the chart to the right (swabs were taken on the inside of gloves, skates and chest pads). In these lab tests, bacteria counts(CFU) before the Fresh Gear process were greater than 1 million! Yet the Cyclone was up to the challenge and virtually eliminated the bacteria. In as little as 20 minutes you can have fresh gear and peace of mind. Many of Fresh Gear operators offer team discounts and mobile services. Contact the location nearest you to confirm available services and prices. Advanced Ozone Destruct Technology: Ensures that ozone has reverted back to oxygen before the doors can be opened by the operator. Meets OSHA and MOL requirements. Ozone (O3) is a 100% all-natural gas that is very a powerful disinfectant. It is 3,000 times faster and 50% stronger than bleach. *Rapidly oxidizes bacteria it comes in contact with, then converts safely back into Oxygen (O2). No nasty side effects for the environment. *Effectively deodorizes, disinfects, and destroys pollutants, fungi, allergens, and other odor-causing agents. *Has long been used in water treatment, food sterilization and medical therapies for its remarkable anti-viral, and anti-fungal properties. Fresh Gear Ozone Technology is the answer! The Fresh Gear process directs high levels of ozone into the areas that make contact with skin, thoroughly sanitizing the gear. We kill up to 99.99% of bacteria in the gear, not just in a petri dish or the exterior surface of sports gear. Chemical free process. No need for special oils, solvents or bleaches. Fresh Gear Cyclone is the only system that dries your sweat soaked gear while simultaneously disinfecting and deodorizing. MRSA is a form of "staph infection" caused when Staphylococcus Aureus bacteria, that is resistant to the Methicillin family of antibiotics, enters the body. These enter the body through cuts and abrasions and can lead to pneumonia, joint and blood-stream infections. MRSA usually appears, at first, as "spider bites" or small boils in the skin. If you experience any like the ones pictured here, consult a physician. NATA, the National Athletic Trainers Association, recommends that athletes avoid sharing towels, razors, and daily athletic gear. Also strongly recommended is to clean and disinfect protective equipment such as helmets, shoulder pads, catcher's equipment and hockey goalie equipment on a regular basis. Fresh Gear's Cyclone cleaning machine destroys harmful bacteria in sports equipment and helps prevent the spread of disease.